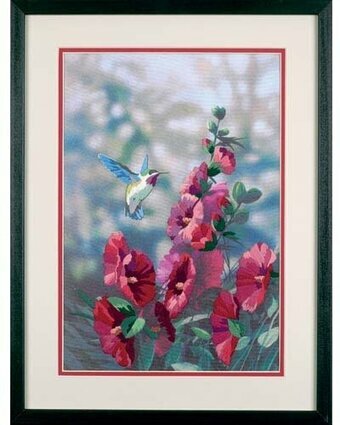 COLORFUL RENDERING OF GARDEN BLOOMS AND AN EYE-CATCHING BUTTERFLY! 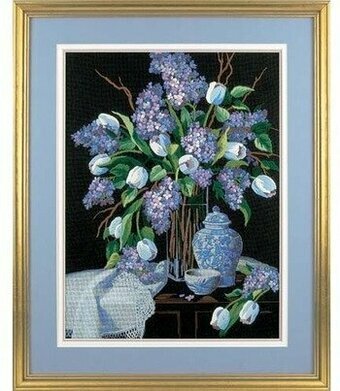 A beautiful work of wonder in this DESIGNS For The Needle Crewel Embroidery floral design by artist, Eleanor Engel. It will be a delight to stitch on this new and beautiful crewel fabric. Each kit contains screen-printed white crewel fabric, 6-strand cotton carded cotton floss, needle, graph and instructions in English, French, Spanish and German. Size: 5" x 7" (12,7 x 17,8 cm). SHOWIEST OF SUMMER BLOOMS! 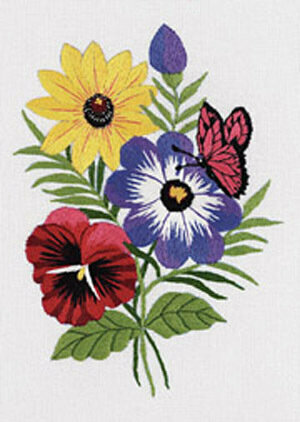 Chase a butterfly through these lovely garden poisies in this DESIGNS For The Needle Crewel Embroidery design by artist, Eleanor Engel. It will be a delight to stitch on this new and beautiful crewel fabric. Each kit contains screen-printed white crewel fabric, 6-strand cotton carded cotton floss, needle, graph and instructions in English, French, Spanish and German. Size: 5" x 7" (12,7 x 17,8 cm). 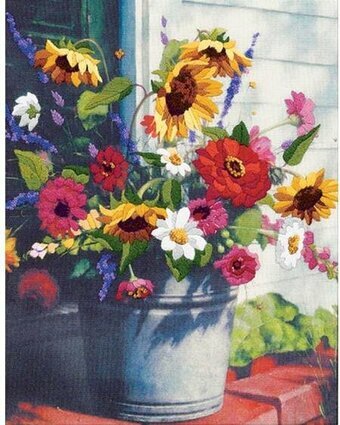 Young at Heart by Dimensions features a plethora of posies surrounding the Greek proverb "The heart that loves is always young". 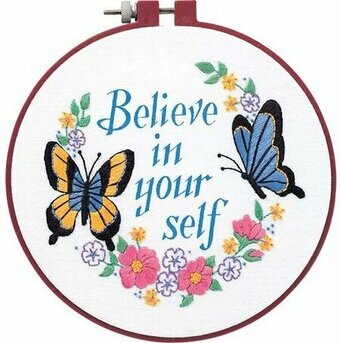 It's worked with fun embroidery stitches using a colorful palette of cotton threads. Size: 5" x 7". Designed by Lori Siebert. 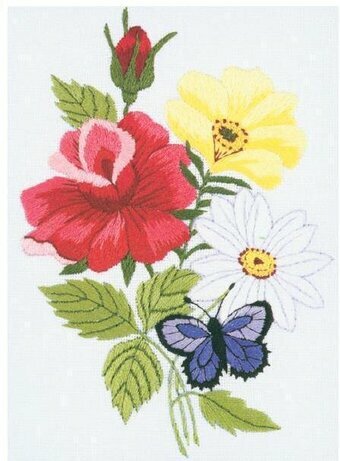 Crewel embroidery kit contains: Presorted cotton thread, Printed beige fabric, Needle, Easy instructions.